It is with much thankfulness and appreciation of the support of my family, friends, and my Taekwon-Do and martial art community that I can announce the completion of my PhD degree in Taekwon-Do (Oriental Philosophy & Martial Arts). My graduation ceremony was on 17 February 2016, and on 21 February I was pleasantly surprised to receive a “Best PhD Dissertation”-award from the Graduate School of Physical Education. humbled by this beautiful gesture of camaraderie. The title of my dissertation is “Promoting Peace, Practising War: Mohism's Resolution of the Paradoxical Ethics of War and Self-Defence in East Asian Martial Arts.” It is basically a paper on the East Asian ethics of war and how this relates to East Asian martial arts. In particular, I aimed to resolve the paradox found in East Asian martial arts that promote peace, while at the same time teach violent martial (“war”) techniques. I honestly enjoyed the research into East Asian religion and philosophy, Just War Theory, self-defence ethics, martial art history, and all the other strands I had to pull from to write the thesis. I hope to continue my research in this and related fields. 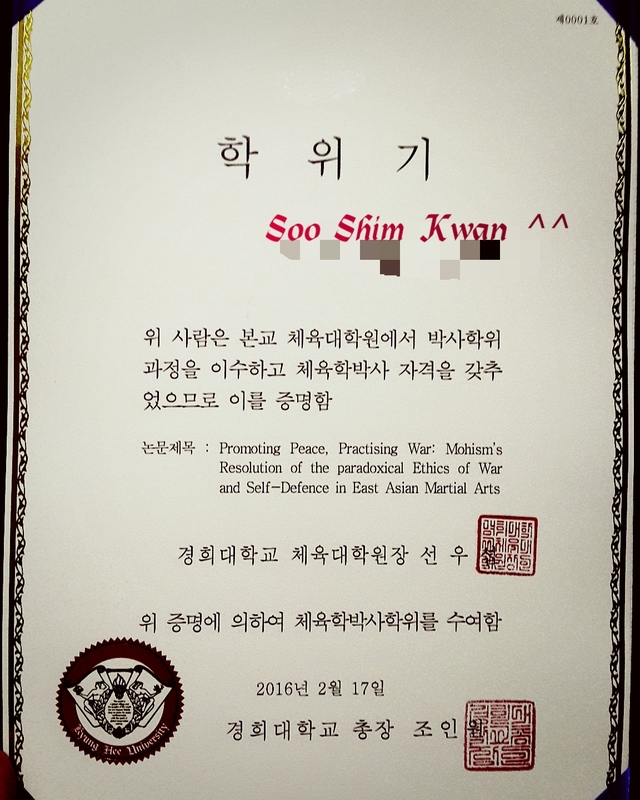 Many people ask me, now that I have a degree—and one in Taekwon-Do of all things—what will I do with it? The honest answer is that I don't know. I was already working as a university lecturer before I started with the PhD, so getting a doctorate fits within my career path. The question for me was in what field was I going to further my studies. 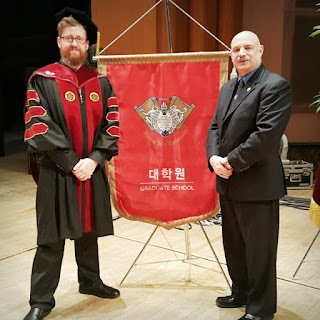 I considered several other fields, but one of the deciding factors for me as an expatriate living in Korea was the uniquely “Koreanness” of this degree. Doing a degree in martial arts philosophy is something quite specific to Asia. 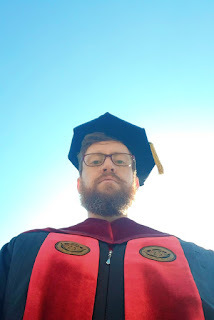 I mean, I could have done a PhD in philosophy practically anywhere in the world—even East Asian philosophy could be done at an Asian Studies department outside of Asia. However, a degree in martial arts is peculiarly East Asian in nature. Thus I decided that as I'm living presently living in Korea, I should take advantage of this unique opportunity. 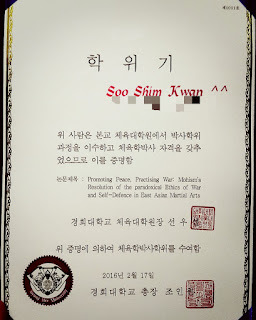 There are only a handful of non-Koreans in the world with a degree in Taekwon-Do and even including Koreans, very few people that specializes in martial arts philosophy. For those of you that do not know, the whole idea of having Taekwon-Do as a university degree was the initiative of General Choi Hong-Hi, the principle founder of this martial art. Gen. Choi approached the founding president of Kyunghee University and proposed to him to start a Taekwon-Do degree program; hence Kyunghee University was the first university to start a Taekwon-Do department. Kyunghee University's Taekwon-Do department is arguably still the top Taekwon-Do department in the country, and the university is ranked among the top ten Korean universities. My annual South Africa trip was much shorter than usual – only three weeks, rather than the customary five to six weeks. Nevertheless, I was able to fit in visits at Soo Shim Kwan and ATC dojangs to present some workshops and spend time with my Taekwon-Do family. I arrived in Johannseburg on Monday, 25 January. The following day I went to Pretoria and visited the Elardus Park, ATC Dojang, run by my good friends, instructors Karel and Annari Wethmar, of our sister federation, the Dan Gun Kwan. For this first workshop I started with a main theme I had for this visit, namely joint-mobility. As I’m getting older I have a bigger appreciation for the importance of range of motion and joint health. It is common for martial artists to focus on muscular flexibility when they think of increasing range of motion; however, the ease of motion of joints in their sockets is often neglected, yet is of much importance, especially as people get older. Although I tried to cover most joints, my main focus was on shoulder mobility and hip mobility, with emphasis on stretching the psoas muscle. The second part of the evening was more theoretical. First, we discussed certain consideration of the sine wave motion when applied to techniques. Because the Elardus Park dojang has so many black belts, I took the opportunity to touch on a few higher level things. In particular, I aimed to give an overview of the ITF pedagogy, as it may be useful especially for instructors. While the techniques we practised weren’t particularly difficult, I think the concepts were challenging as I questioned the way many ITF practitioners understand some basic movements. My aim was to get the black belts thinking critically about what they are doing. Finally, we worked on kicks for different angles of attacks, as well footwork for spinning kicks. My time spent with the ATC folks are always very enjoyable. The students are of great caliber and the instructors are such great friends of mine, we always talk late into the night and always complain that we do not have enough time. 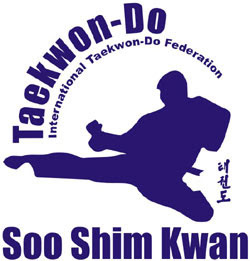 The following day, Wednesday, 27 January, I went to the Soo Shim Kwan school in Groblersdal. Instructor Gerhard Louw’s Horangi Dojang was a priority for me this year. Last year I was not able to go to Groblersdal, so this year I placed it high on my priority list, as I promised Instructor Gerhard that I will visit him the next time I go to South Africa. Spending time at the Horangi Dojang was an absolute treat. The passion of the students and their families is tangible, and the level of some the children are some of the best I’ve seen for Taekwon-Doin youngsters in a long time. Unfortunately I came down with a bug, and felt terribly under the weather. I had a fever and was lightheaded while presenting the two hour workshop, but I tried to hide my discomfort as best I could, and focussed on teaching as best I could. I really aimed at highlighting specifics that the students could make part of their basic training. We started again with a focus on mobility work, as well as other stretching and warm up exercises that I thought they may benefit from, to supplement their current warm up routine. Since a number of the new members of the Horangi Dojang are adults in their thirties and fourties, I felt it imperative to emphasize the importance of proper warming up. We then moved on to kicking drills, and foot work. Third, I spent some time in teaching break falls and rolls. I focused mainly on the basics for falling and rolling and showed some more advanced techniques that the students could do as they master the basics. Finally, we did some self-defence training. At the very end the students requested me to perform some patterns. By this time I was really feeling sick and jet-lag was in full-swing, but I obliged. I chose some of the forms that I thought I knew best; however, I got stuck on both forms. So I asked Instructor Gerhard to join me for a form to help jolt my memory. We did a form—without getting stuck this time—and the students really seemed to enjoy it. I know that my technique was not very good (and pray that nobody uploads the video onto YouTube), but I am happy for the opportunity to have performed a form with my friend at his school. The following evening the Horangi Dojang planned a special dinner. 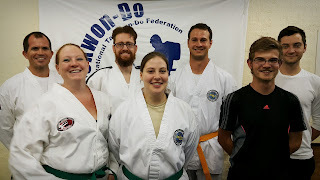 It was amazing to share some time with them and get a feeling for their great camaraderie and passion for Taekwon-Do. 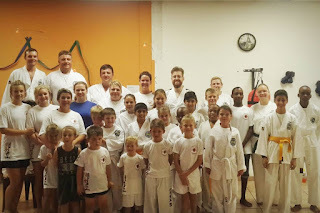 It is definitely a testament to Instructor Gerhard’s character to get his students and their families behind him in such a manner. As I was still feeling rather awful, the Louw’s nursed me with some medicine, and I must admit that I felt much better by Friday. I should really have taken medicine earlier. 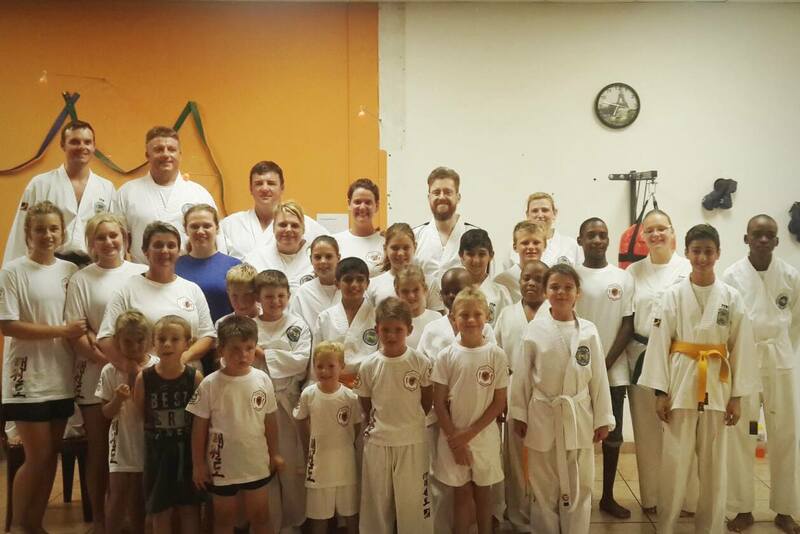 the Potchefstroom Dojang, North West Province. The following week I went to Potchefstroom and got to teach at the Potchefstroom Taekwon-Do Club on both Tuesday and Thursday evenings. Since the Potchefstroom Dojang is my first dojang that I started, I will always have a soft spot for it, and it always feels like coming home when I enter the Potch Dojang. Over the two nights I covered much of what I had covered at the ATC and Horangi schools the previous week. However, the longer time allowed me to go into a little more detail. I also shared a little more philosophy and focus more on theory. Since the Potchefstroom dojang has fewer members than the Elardus Park and Grobblersdal schools, it was easier to give more individual attention to the students, which was nice. On the Thursday evening Instructor Philip de Vos and I went out for dinner to catch up and talk about some important topics. While in Potchefstroom I also met up with Master Louise Villiers of Tang Soo Do, who is the president for Martial Arts South Africa (MASA), which is a branch of SASCOC. It was great to catch up with Master Louise again, and also a very informative and fruitful meeting. Master Louise and I have a long history of cross-training and supporting each other with our respective events. For the rest of my time in South Africa I focused on seeing family and friends. An important part of my trip was visiting my ailing, 80-year old father. I was able to give my father a formal, printed copy of my PhD dissertation. While my father is too weak and will likely not read it, it was nevertheless nice to give it to him, as he will not be able to attend the graduation ceremony which will occur later this week. My trip in South Africa, although much shorter than usual, was most definitely a fruitful one.